Is it really health and safety gone mad? Surely the standards on equipment are so high that they’re not as dangerous anymore? Is it easy to remember that the equipment you are working with is quite hazardous when you’ve been working with it for a very long time? Workshop safety is everyone’s issue. Unfortunately accidents in the workshop can and do still happen, and if anything they feel more jarring thanks to a perception that they aren’t as feasible with today’s safety standards. From loss of limbs to 3rd degree burns it is possible to find cases of severe accidents from any workshop. These workshops would have had appropriate safety measures in place, carried out all the risk assessments, and hung up all the warning signs. It reflects on the fact that workshop tasks and equipment come with high risk levels and that health and safety should be a priority for everyone. In 2016/17 the UK government reported 31.2 million working days lost due to work place related illness and injury. Of nearly 700K non-fatal injuries 4% of these resulted from contact with machinery. This still accounts for over 27,000 injured by the equipment they would have worked with day in day out. With earning potential, days without pay, and entire livelihood on the line the impact of H&S accidents is an issue for the individual and not just the company. One of the highest risk of injuries from Hartridge machines comes from the high pressure functions of the machine. High pressure injuries do not behave like any other type of injury and they need to be dealt with in a certain way. If left unattended the wound can result in loss of limb & function. A paper on high pressure injection injuries updated in Jun 2017 reports that diesel fuel injection accounts for 14% of all high pressure injuries which tells us that these accidents are still occurring in workshops. Extreme pressures can force material through the skin and damage nerves, tendons, and joints. A high pressure injury may not look too bad at first, maybe like a simple cut but they deteriorate quickly and extremely. Be sure to seek emergency medical assistance immediately, taking along details of the incident such as pressure level and type of fluid or chemical involved. 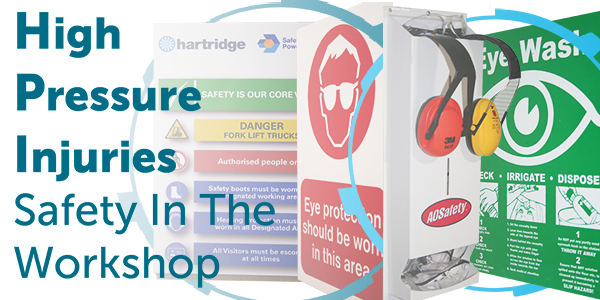 If you are in any doubt as to what you need to do in your workshop then speak with your trained first aiders and check on the health and safety measures required in your workplace. Should a high pressure injury occur then we would ask that Hartridge be contacted so we can offer advice and be able to investigate how the accident happened to be sure it won’t happen again. 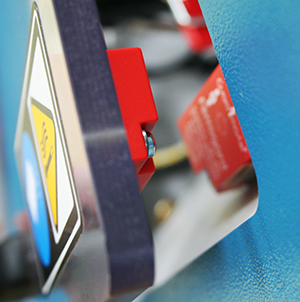 Our equipment operates at thousands of PSI so we have built many safety measures into our Sabre CRi Master and other Hartridge machines as well as always advising personal protection equipment. On the Sabre CRi Master you will find door interlocks that prohibit the machine from operating if the door guard is not shut. Upon opening the door, and in the event of a fault, the interlock system relieves the pressure in the machine & stops running. There are also two layers of guarding on the high pressure circuits. The Sabre monitors the fluid temperature at all times and will cease function if over heating. Our software will not run the test steps if it detects that the injector has not been set up safely. We have designed all the tooling to be installed extremely simply, often by just clicking in place, so it is easy to get it right. Finally, you will always find a large isolator switch and motor stop button for rapid shut off of the test. It would be inadvisable to work with any machinery less equipped than this. Safety is at the heart of Hartridge.